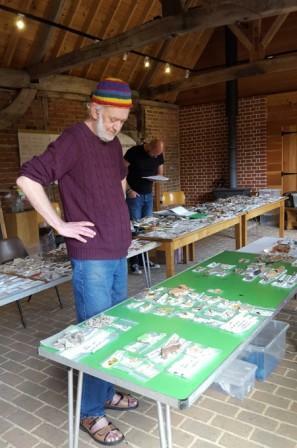 This week the pottery finds from the Randall Manor dig have been laid out in order to compare with the stratigraphy of the site, with the aim of dating the site more securely. Thanks to Nigel for sharing his knowledge with us. Thanks also to the Kent Archaeological Society who have funded the work. The Hollow Way has now been back filled (thanks to all who helped) and tomorrow Nigel will take a look at the pottery excavated from the dig. It should reveal a nice archaeological story relating to both trenches. 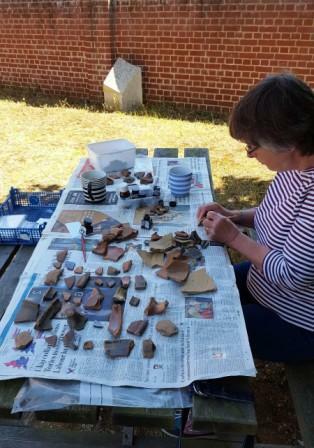 While this was going on inside the barn at Cobham, outside others were marking mainly post-medieval pottery retrieved from a Cobham dig in 1962. This entry was posted in News & Events, Sites and tagged ceramic, Cobham Landscape Detectives, cobham village, randall manor. Bookmark the permalink.